The ticker is a dead giveaway, but I’m betting that most of you don’t know what it is. This is a chart of implied correlation in the S&P 500. Many of you have probably heard of the term index arbitrage, that there is a direct mathematical relationship between the stocks in an index and the price of that index. 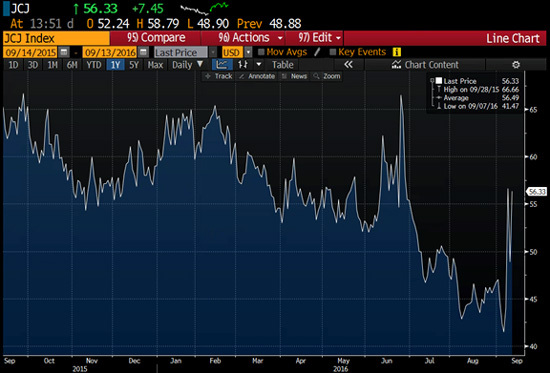 There is also a less direct relationship between the prices of index options and options on the constituent stocks. Using index options and single-stock options, you can calculate what is known as implied correlation, which is a measure of how the market predicts stocks will move together. When there is turmoil in the market, correlation moves dramatically higher. You know this through experience. When the Dow Jones is down 300+ points, you can pretty much assume that all stocks are down together. Implied correlation is currently spiking higher. Which is not good. Although I suspect that is an honest question. Run to where? Sell stocks and go to what? Bonds? Too expensive. Sell bonds and go to what? People are seriously undereducated on the benefits of being in cash. The cool thing about cash is that it doesn’t go down. You can’t lose money if you have cash, unless it gets stolen or your bank account gets hacked. We don’t have negative interest rates in the US yet, so you can’t complain about that. If you have money in cash, you will earn zero. Earning zero is better than losing it! People get wrapped up in the opportunity cost of holding cash. Screw that. This is the number one question I get from “less sophisticated” investors. People throw around the term financial repression a lot, without really knowing what it means. What it means is that your investing goals should be a lot more modest than they are currently. You should be happy with 4-6% returns. You should be happy with zero returns! Of course, it wasn’t always this way. People’s expectations are grounded in a time when you could make 6.5% a year in cash, and substantially more in equities or risky credits. There is no law that says you always have to be fully invested. In fact, just the opposite. I like to have as much cash as possible at any point in time. Cash is an option to buy something cheaper in the future. In my mind, there is nothing worse than being fully invested… on the highs. The market corrects, and you have no ammo to buy stuff cheaper. You’re trapped in your existing positions. It’s always good to have cash. Lots of cash. Many people don’t see it that way. They look at cash as a drag on your returns. Maybe if you are a large cap growth manager trying to closet index the S&P 500. But as an individual investor, you have no benchmark you’re trying to outperform. You’re an absolute return investor. Same as a hedge fund. If the whole world were going to crap, you would want your hedge fund manager to be in cash. You probably wouldn’t be happy about paying fees on cash, but it’s better than the alternative. Remember, you are your own hedge fund manager. And you don’t have fees on cash. There were a handful of investors who were waiting with a big ole catcher’s mitt to buy the banks at the very lows in March of 2009. Now, the fancy part of that hero trade is not calling the bottom. Anyone can call the bottom. The fancy part of that trade is having the liquidity to do it. Having the cash. That is what I have respect for. Remember, cash is an option to buy something cheaper in the future. My guess is, things will get cheaper in the future.